Community is composed of all populations living in an area. Communities are not random mixtures of species. They have a unique organization. Most communities have certain important members. These members determine the characteristics of community. For example, a stream community has a large population of rainbow trout. These trouts determine the population of certain invertebrate populations. Trout feed on these invertebrates. Species that determine community characteristics are called dominant species. Communities contain variety of animals. These animals also characterized • the community. This variety is called community diversity or richness. Different factors promote high diversity. These factors are variety of resources, high productivity, climatic stability, moderate levels of predation, and moderate levels o’ disturbance from outside the community. Pollution often reduces the species diversity of ecosystems. What conditions of temperature and moisture it requires. pioneer community. Additional nutrients are added to the community by death and decay of older organism. Other seral stages: The nutrients accumulate over thousands of years. Therefore, the characteristics of the ecosystem are changed. Each successional stage is called a seral stage. The entire successional sequence is called sere. The dominant life forms of a sere make the area less favorable for themselves. But it makes it favorable for organisms of the next successional stage. Therefore, succession occurs there. Climax community: The final community is called climax community. It. can tolerate its own reactions. Therefore, it is different from the earlier seral stages. Accumulation of the products of life and death does not make it unfit for the individuals living there. Climax communities usually have complex structure. It has high species diversity. Food Web: Complexly interconnected food chains are called food webs. Many kinds of organisms are involved in food web. (a) Producers (autotrophs): They obtain nutrition from inorganic materials. They form the first trophic level of an ecosystem. The Most familiar producers are green plants. 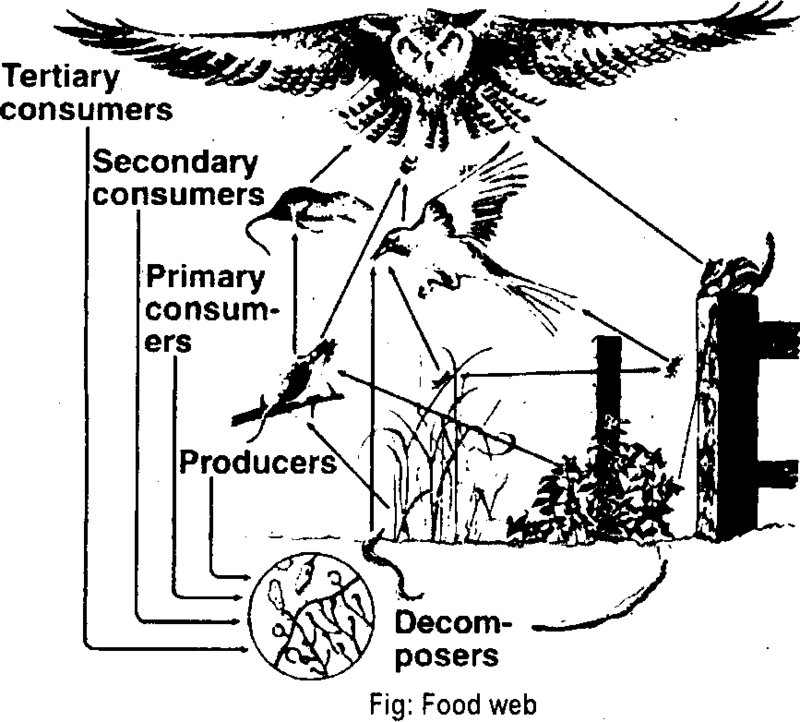 (b) Consumers: Other trophic levels are made , up of consumers (heterotrophs). Consumers eat other organisms to obtain ‘ energy. 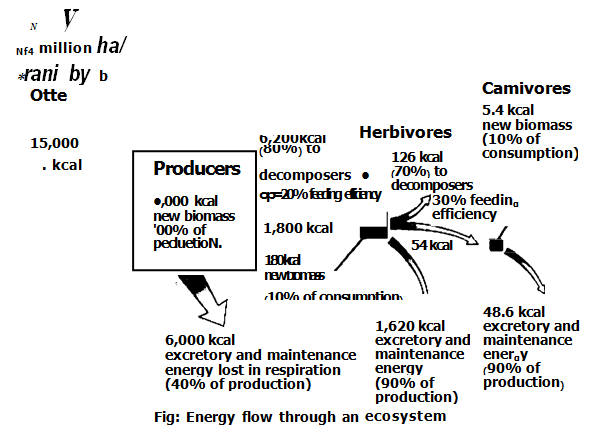 Herbivores (primary consumers): They eat producers. (ii) Carnivores (secondary consumers): They eat herbivores. 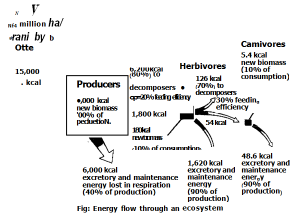 (iii) Other carnivores (tertiary consumers): They eat the carnivores that ate the herbivores. 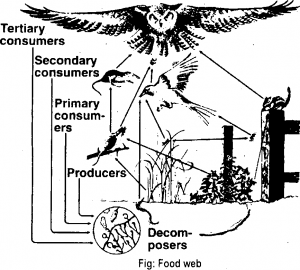 (iv) Scavengers: The consumers that feed on large chunks of dead and decaying organic matter are called scavengers. organic matter extracellularly and absorbing the products of digestion.